A new year means another new home brew, in particular another pale ale overflowing with ultra-piny yarrow blossoms and a generous helping of complimentary hops to add some flavors and aromas of citrus and coniferous woods. I’m really getting into the swing of home brewing on a regular basis now, mainly because there is a lack of outdoor activities that I am willing to participate in this time of the year but also because I’d like to be able to enjoy a regular supply of (hopefully) delicious home brewed beer. If you have not heard of or checked out my previous posts regarding the creation of and tasting notes of Achille’s Heal 1.0 then you can check out both of those articles here and here. I also go into a bit of an ethnobotanical lecture regarding yarrow in the recipe post which is one of my favorite parts about brewing with medicinal herbs. I find their rich biological history and contribution to human cultural evolution so fascinating and I love even more to share that context with others and hopefully you like hearing about it too. An added bonus of making beer in the winter is the rather convenient wort chiller that operates for free and is located immediately out the back door. During the summer, waiting for the hot wort to cool down to the right temperature in which to pitch the yeast can take the greater part of a day, especially if you don’t feel like putting your super heated brew pot (if it will even fit) into a refrigerator and have it heat up the inside and make your milk go bad (maybe). You could fill a laundry sink with a bunch of ice for the wort to sit in or submerse the pot in your bathtub filled with cold water or ice, but any way you look at it this process it uses resources and energy in order to chill the wort faster than just letting it be. Alternatively in winter it could be said that the exact opposite is true where a lack of energy (in the form of solar heat) is responsible for your ability to cool down your wort in fast forward. Before I forget, I also feel the need to mention that upon reading my previous recipe and review posts for Achille’s Heal 1.0 I realized that I didn’t keep my original promise of trying out and informing you all of an updated recipe before year’s end. I hope that no one actually listened to my suggestion to make a bet on whether or not I would introducing you to something new before the end of 2014, because if you bet that I would then you definitely lost and I probably owe you a couple bucks. Although you only lost by around a month, so it was pretty close, relatively speaking. Anyhow this time around I am making a couple of adjustments to the recipe but not that much. I am going to be using dried yarrow blossoms for this recipe, as well as small amounts of the leaves and stalks which I harvested back in August with the flowers to make their collection and handing easier. When using dried herbs in a recipe, I have heard that it is commonplace to reduce the amount of herb called for by half when the recipe that you are using asks for fresh herbs. Since my last recipe used fresh yarrow blossoms I am going to reduce the amount by only about a third, and only a third instead of half because I felt that there could have been more of the unique flavor and aroma of yarrow in the final product. When herbs dry, the water in them evaporates and this concentrates the flavors and medicinal properties of the plants because there is physically less water within them to dilute the active constituents (although this is certainly not true for everything, as some medicinal herbs need to used when fresh due to the fact that their medicinal compounds deteriorate when water evaporates out of them). I am also going to experiment with completely different hop varieties for this installment of Achille’s Heal. I’m not trying to say that I didn’t enjoy the Amarillo and Tettnang hops that I included in the first version of this recipe but I am rather curious and would like to find out what sort of things Magnum and Pacifica hops have in store. It may be a long and drawn out process trying to find the ideal hop varieties to pair with yarrow. An all out yarrow beer without any hops may be a little too adventurous, although I have had an excellent honey mead that was flavored with whole flowering stems of fresh yarrow. Another experiment for another time. 1. Bring 1-1.5 gallons of water to a boil. Remove from heat and stir in liquid barley malt extract until fully incorporation. Return to heat and bring back to a full boil. 2. Add 1 ounce of your yarrow and 1 ounce of Magnum hops. Briefly stir to incorporate. Set time to 60 minutes. 3. At the 15 minute mark, add 1/2 an ounce of your yarrow and a 1/2 ounce of Magnum hops. 4. At the 10 minute mark, add 1/2 ounce of Pacifica hops and 1/4 ounce of Magnum hops. 5. At the 0 minute mark, add the remaining 1/2 ounce of Pacifica and 1/4 ounce Magnum hops and 1/2 an ounce of your yarrow. 6. Allow the yarrow tops and hops to steep in the hot wort until at least 90-100° F.
7. Strain hot wort into the fermenter a little bit at a time, alternating with cool water until the total amount of diluted wort is 4 gallons. 8. Add trub* and the last 1 ounce of the yarrow inside of a tied muslin bag to infuse into the wort as it ferments. 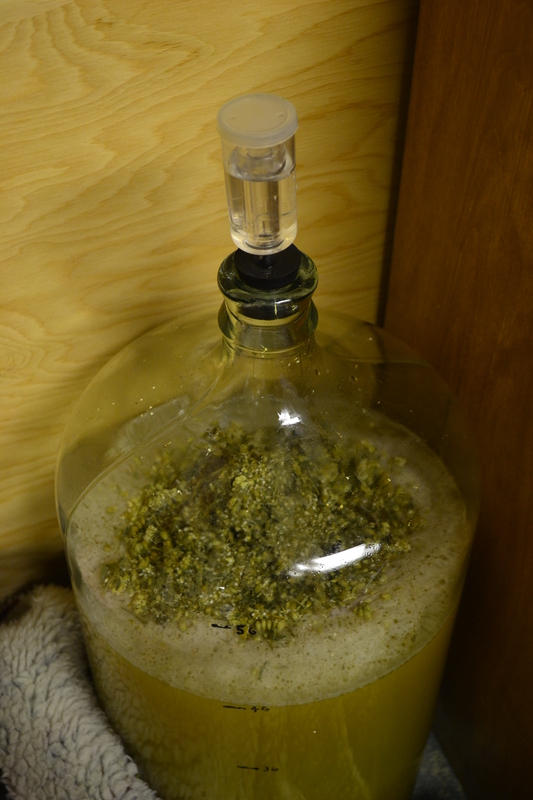 Insert airlock and ferment until complete, about a week or 10 days. * Trub is the name given to the yeasty sediment that collects at the bottom of your fermenter after the more vigorous stage of fermentation is beginning to tapper off and your brew is calming down. Trub also contains hop sludge and any other fine or course particles that made it through from your wort into the fermenter. Much of the yeast contained in the sediment is not actually dead but in a state of suspended animation awaiting improved conditions where the microorganism can once again proliferate. This yeast can therefore be saved from the bottom of your fermenter after bottling and kept in a clean jar/container in the fridge and be used to ferment more beer. So if you are feeling thrifty and frugal like I am most of the time, try creating your own sort-of sour(beer)dough culture from your beer yeast and use it over and over for every batch that you make instead of spending the money on purchasing fresh yeast every time you want to make some beer. If you are super into consistency and ‘professionalism’ with your home brews or want to experiment with vastly different styles (stouts to light ales, etc.) then this method may not be for you as different yeast strains will add various flavors and give different alcohol levels. With this method of yeast saving you may also notice minute flavor crossovers which definitely happen but may not be detectable except for only the most refined of palates, but I’m just throwing this option out there so that at least you can’t say that you didn’t know about it.